iSCSI (Internet Small Computer System Interface) is an IP-based storage networking standard that allows users to access data stored on a remote server from a number of computers within a specific network by linking computers over the Internet. It transfers data over local area networks, wide area networks, and the Internet. 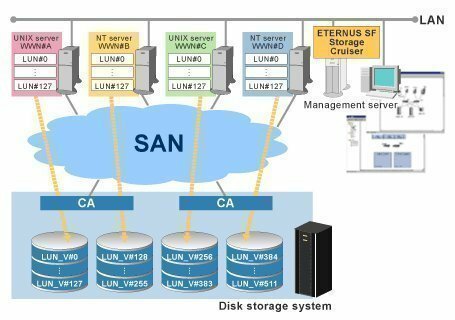 iSCSI places a shortcut on the user’s computer in order to provide the illusion that a user is storing data on his/her computer while the data is actually stored and retrieved from a remote server or a remote computer’s hard drive. NAS (Network-attached Storage) is a storage device that is directly or wirelessly accessible with a computer network. NAS devices allow multiple computer users to store their files and other data on a locally accessible server without having to access the Internet. They allow faster file access as well as easier administration, configuration, and maintenance than is required when accessing a remote server. 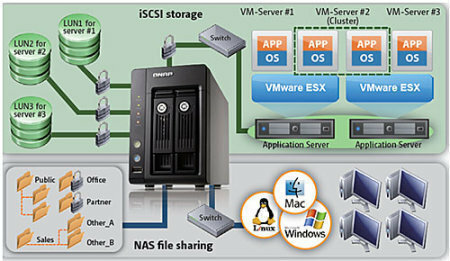 iSCSI and NAS storage devices are similar and provide many of the same functions. However, iSCSI and NAS storage devices have their own, specific applications. For example, iSCSI storage devices are often used with intranets, extranets, and computer networks that span across several buildings or multiple locations. Conversely, NAS storage devices are generally used for home computer networks, office networks found in small businesses, and networks that wish to have a redundant copy of its data. The main difference between iSCSI and NAS storage devices is that iSCSI systems are used in conjunction with the Internet while NAS systems store data within a private network for data that the network generates and consumes, although NAS systems use the Internet as well. Both iSCSI and NAS storage devices have significant advantages. For example, iSCSI storage devices transfer and store data over long distances without requiring any special equipment. Also, iSCSI storage devices allow easy administration by providing each client with a virtual drive that is linked to a remote server. NAS storage devices have the advantage of storing data within a specific network, allowing faster data transfer rates, easier configuration, and simpler administration. Additionally, NAS storage devices do not require the Internet in order to transfer files to and from each client within the network. 117 queries in 0.238 seconds.